There are 3 tests that you MUST undertake to determine whether or not you are allowed to construct or replace a sewage soakaway drainfield at all, done in this order: They are all mandatory under Building Regulations. 1st Test Ascertain whether or not your soakaway drainage field site is in an area designated by the Environment Agency as a Groundwater Source Protection Zone. If it is, then it means that the groundwater underneath your soakaway is used for drinking water and you will not be allowed to pollute it with sewage effluent from a septic tank soakaway. Contact us and we will be able to determine this on the phone. 2nd Test The Trial Site Assessment Hole (TSAH) This is a single, large hole which is a minimum 2 metres deep. It is to determine that the water table or bedrock never reaches to within 1M of the bottom of the soakaway drainfield pipe. Many sites in the UK fail this vital test and many builders and tank installers never carry one out - until it is too late. If this test fails, then it is pointless doing any percolation tests if you are thinking of installing an underground drainage field. We can, however, design an above ground soakaway drainage field (Copyright WTE Ltd.) for you if you have enough land and no other alternative. 3rd Test The Percolation Tests. If the water soaks away either too fast or too slowly, then a soakaway drainage field is not permitted. In general, clay soils will fail and it is not worth performing the tests. This is the test that most people associate with soakaway tests, as it has been mandatory for much longer that the TSAH. The Percolation Test tests the porosity of the soil immediately below and surrounding the 300mm. of drainage stone in the trench below the pipe. Our above ground mound soakaway design (Copyright WTE Ltd. 1996) can solve the problems of clay soil percolation failures. 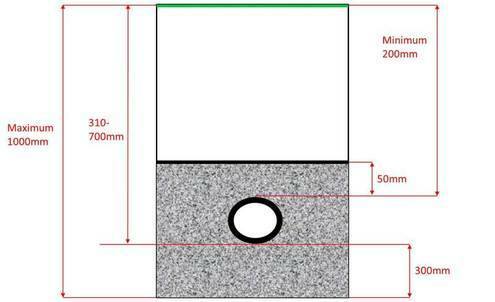 Percolation Tests CANNOT be performed at more than 1 metre deep to the bottom of the percolation test hole. This is clearly stated in the Building Regulations and the BS6297 2007 as the maximum depth allowed for soakaway pipework is 700mm, with 300mm. of washed drainage stone below this in the trench. The length of the soakaway drainage field drains is determined by the number of bedrooms in the house and the porosity of the soil. The new regulations state that for any house up to and including 3 bedrooms, the minimum size sewage system that can be installed is for 5 persons, with one extra person added for each extra bedroom. A 3 bedroom house requires a 5 person plant, a 4 bedroom house a 6 person plant, etc. The porosity can only be determined by a percolation test which measures the time it takes for water to drop 1mm. in the percolation test hole. 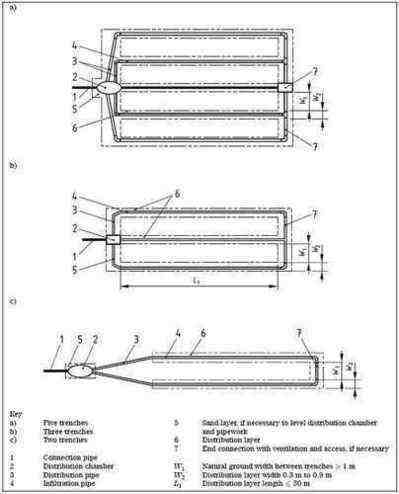 From this time, known as a V value, the length of drain required can be calculated. The Environment Agency states in their General Binding Rules that SOAKAWAY CRATES AND TUNNELS etc. are not allowed for foul water drainfields as they do not comply with either Section H2 of the Building Regs. or BS6297 2007 +A1 2008. Neither do BOREHOLE soakaways. They are both for rain and storm water only. BEWARE of adverts on the internet and report the cowboy traders to Trading Standards. Also see Drainage Fields - Regulations from British Water. 10m from a watercourse or ditch. 50m from water abstraction points. 15m from any building, and sufficiently distant from any other soakaway, including roof water. 2 metres from a boundary. 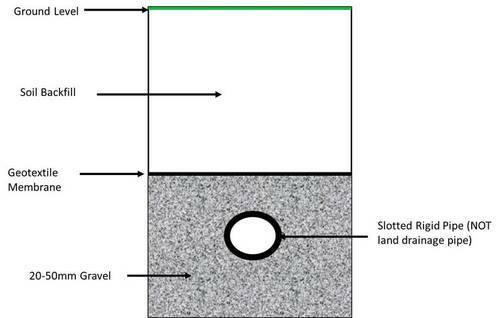 The soakaway drainfield area should be downslope of groundwater sources. 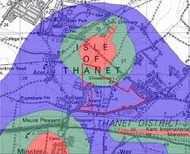 No water supply pipes or underground services should be within the soakaway drainfield area. No access roads, driveways or paved areas should be within the soakaway drainfield area. This includes fields with tractor and agricultural vehicular traffic. The water table or bedrock must not, at any time, be within 1 metre of the bottom of the soakaway drainage pipe itself. This usually means that it has to be a minimum of 2 metres below ground, at all times. 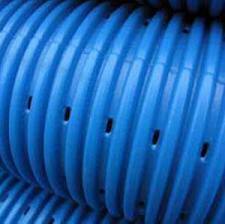 The maximum depth allowed for soakaway drainfield pipework is 700mm. The maximum length of a single pipe-run is 30 metres. No rainwater must be allowed to enter the system - consider a rainwater harvesting system instead. Use SOLID perforated foul drainage pipe, with the slots/holes at the bottom, laid in trenches of a uniform gradient not steeper than 1:200. Perforated 'Flexicoil' land drainage pipe is NOT allowed nor are soakaway crates or tunnel systems. These are designed for SURFACE ROOF WATER ONLY. Pipes should be laid at a minimum depth of 200mm and a maximum depth of 700mm. to enable aerobic contact between the effluent and the drainage stone and soil particles. Soakaway drainfield trenches should be filled to a level of 50mm above the pipe and covered with a layer of geotextile membrane to prevent silt entry. The remainder of the soakaway trench can be filled with topsoil. 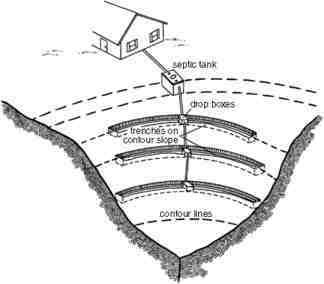 An inspection chamber should be installed between the septic tank and the drainfield. The soakaway drainfield layout should be set out as a continuous loop fed from the inspection chamber, NOT a straight pipe run with an 'end'. The soakaway drainage pipes should be fed by a distribution chamber. The area of the soakaway drainfield is calculated after carrying out a minimum of three percolation tests in the proposed drainfield area, over three consecutive days and applying a formula as detailed on the Percolation Test page. A foul water soakaway drainfield is NOT a ‘Pit filled with stones’ or 'Crates' etc. These types of sewage effluent soakaways are built by 'Cowboys' who don't know the regulations. They are ONLY allowed for surface roof water, NOT sewage effluent. It does not rain every day. Soakaway pits fill up when it rains and drain when it is not raining, but sewage effluent discharges EVERY day, with no dry days to allow the pit to drain. The pit becomes full and the sewage either 'backs-up' the pipes or bursts through the surface of the ground. It is not a serious matter if rainwater bubbles to the surface of the ‘pit’ during extreme weather, but sewage effluent surface contamination is an entirely different scenario. Please visit Sewage Problems if you have soakaway issues with your current system. Also visit Failed soakaway drainfield insurance claims. The Building Regulations (and the BS 6297 2007) state that the sewage effluent MUST be in constant contact with the AEROBIC particles of the soil. 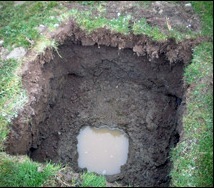 As the aerobic soil layer ends at 1 metre below ground, soakaway pits are not allowed.